The species is widespread throughout much of Britain. It is widespread in western and central Europe. In the south, L. zimmermanni is mainly a woodland species. It is frequently found amongst leaf litter and under logs in both broad-leaved and coniferous woodland. Further north it is much more widespread and occurs in a wide variety of habitats from sea level to the summits of high mountains. 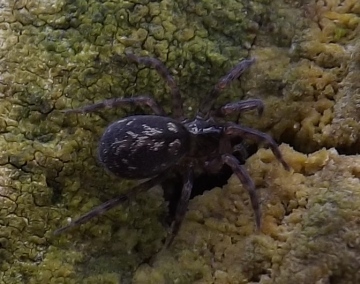 On exposed coastal sites (cliffs) this spider is found beneath overhanging low vegetation. L. zimmermanni is more frequent than L. tenuis in upland grassland and moorland where it inhabits clumps of low vegetation (grass, sedges, rushes and moss). A Dundee Museum pitfall survey in the Sidlaw Hills of Angus found L. tenuis to be more frequent in grasslands and L. zimmermanni to be more numerous in heather (J. Stewart, pers. comm.). On high mountain summits it lives beneath felsenmeer rocks. Adults of both sexes can be found throughout the year, mostly in summer and autumn. The spider is common within its varied habitats. It is one of the most frequently encountered spiders in the Welsh mountains (Goodier 1967).